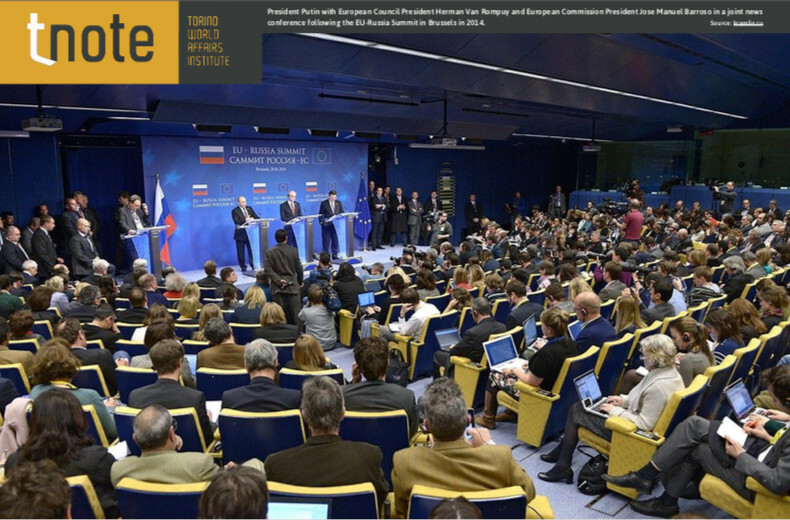 Home | Magazines | Whither EU–Russia Relations? In the 1990s, the risks associated with the rise of the new post-Soviet authoritarianism were not taken seriously enough by Western actors. Back then, the EU repeatedly attempted to extend its sphere of influence by promoting the values of democracy, human rights and the rule of law in Russia. These efforts have clearly gone unrewarded: the EU has failed to facilitate an improvement in governance, while those few projects that have enjoyed some success have largely been invisible, considering the scale and size of the country. Moreover, the ‘practical’ approach pursued by some EU member states has further encouraged the Russian leadership to focus on bilateral relations with individual states rather than on those with the EU as a single entity. This, in turn, has undermined the limited successes of the EU. The instruments in place were simply too weak to have the desired effect on Russia. EU leaders considered the mere avoidance of a reconstitution of the Soviet Union as sufficient to guarantee Russia’s democratization. To a large extent, wishful thinking has overtaken approaches grounded in reality. The last significant breakthrough in the development of mutual relations came in 2003 when Russia and the EU signed a Strategic Partnership and set a new format for their relations – although it never reached the level of cooperation called for by a truly strategic partnership. In Russia, President Putin has busied himself with the construction of his ‘great Russian state’, while the EU has focused on managing its enlargement and various internal problems. Both in Russia and in the EU, politicians have relied on continuing external tensions as a mechanism for generating internal consensus while implementing transformations in their respective political systems. At the same time, trade between Russia and the EU experienced a period of growth, to the satisfaction of both sides. Since 2000, EU–Russia relations have in fact been characterized by the increasing separation of politics and economics, but the 2014 Ukrainian political crisis ruptured the status quo and sent important signals to both parties. First, the crisis has shown that Russia and the EU have fundamental differences when it comes to their views on international order. Moscow sees the world as multipolar, with a limited number of powerful actors dominating the international system and having unconditional freedom of action in their respective spheres of influence. While the Russian approach gives absolute priority to bilateral relations, the EU definitely champions multilateralism and, in so doing, undermines the capacity of a country to act freely within its domain – a principle that remains of vital importance for the Kremlin. The EU thus represents by default a challenge to Russia’s approach to international relations. The Ukrainian crisis has also shown that these fundamental dissimilarities have a stronger influence than the economic factor; the belief that economic interdependence alone would prevent the breakdown of EU–Russia relations has proved to be wrong. Second, the crisis has signalled that the region of ‘common neighbourhood’ (which includes post-Soviet nations located between Russia and the EU) is and will remain a zone of deep tensions and conflicts between major European powers. The fortunes of the countries of the ‘common neighbourhood’ depend to a large extent on the character of EU–Russia relations, and the current state of affairs presupposes that they only have a binary choice: with Russia or with the EU. Russia and the EU have very different agendas with regard to these countries. The EU directs its efforts towards the gradual Europeanization of these countries through economic and political reforms, while the priority for Russia is to keep these countries in its orbit through a complex system of rewards and punishments. Third, the Ukrainian crisis and its aftermath have revealed the profound difference between the EU and Russia with regard to the interrelation between foreign and domestic policies. For the EU, the common foreign and security policy has always been somewhat in the shadow of the domestic sphere and the Economic and Monetary Union, which have been the indicators of the success of the project of European integration. The situation in Russia is completely different: it is foreign policy (and not domestic policy) that confirms the successes of the Russian state as a ‘great power’ in the eyes of its internal audience, and therefore the main tool for regime stabilization and consolidation is indeed foreign policy. Since the Ukrainian crisis, both sides have turned towards more coercive strategies, such as diplomatic and economic sanctions. Experts are not convinced of the effectiveness of EU sanction regimes against Russia. However, assessment of the effectiveness of a policy tool largely depends on expectations: if the expectation is that sanctions will lead to the desired changes in the political regime in Russia, then the effectiveness of the policy tool is nil. Instead, if the expectation is that sanctions will restrain Russia from aggressive external actions and will have an impact on Russia’s reputation in the world, then the potential (long-term and strategic) effectiveness of the tool might be much greater. Russia and the EU now seem further from achieving sustainable relations than they have been at any point since the end of the Soviet Union. And there is little reason to expect rapid or drastic change to this picture in the coming years. In today’s difficult situation, the differences between the approaches of the EU and Russia are especially noticeable. The EU is concerned about how to build (or if not to develop, at least to maintain) relations with Russia under the restrictions imposed by sanctions. In 2016, this concern produced five guiding principles for the EU’s policy towards Russia; they were presented by the EU External Action Service and included a call for (a) the full implementation of the Minsk Agreements; (b) the strengthening of relations with the EU’s Eastern partners and other neighbours; (c) the strengthening of the EU’s resilience against Russian threats; (d) selective engagement with Russia; and (e) support for Russian civil society and the expansion of people-to-people contacts. All in all, these principles well describe the limited ‘room for manoeuvre’ available, as it seems extremely difficult (if not impossible) to follow these principles and at the same time to advance the relationship between the EU and Russia. While the EU is at least trying to develop a common approach towards Russia (although not a very successful one), we are witnessing a complete lack of incentives for Russia to improve its relations with the EU. The endless rhetoric about Western actions against Russia not only entertains the country’s domestic audience but also offers an important source of legitimization for the political regime. In addition, Russia’s leadership strongly anticipates that in the near future the internal troubles of the EU will increase and solidarity among its members will drop. From this standpoint – and considering also the mounting tensions between the EU and the US, with the progressive weakening of the former – Russia might see the problem resolve itself.